Mat specializes in Sports Medicine and the treatment of spinal pain, as well as orthopedic post-operative patients. While Mat has experience treating orthopedic patients with a wide range of ages and diagnoses, he has a particular interest in total joint replacements and rotator cuff and ACL reconstruction. He received his Bachelor of Science degree in Health Science as well as his Doctorate of Physical Therapy from Boston University’s accelerated program. Mat has undergone post graduate training in the field of concussion rehabilitation, postural and ergonomic assessments, and manual therapy techniques of the spine and peripheral joints, among others. Mat’s treatment approach combines manual treatment with therapeutic exercise and includes a unique, personalized treatment plan for each patient to maximize function and eliminate pain. 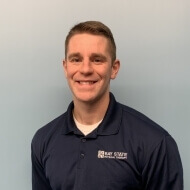 Mat has spent the past several years as Clinical Manager of our Beverly location, and now sees patients in our Burlington clinic Monday through Friday. Mat remains active and enjoys working out and playing recreational sports. He plays in a local men’s basketball league and enjoys spending time with his wife and cat, as well as cheering on the local teams, especially BU hockey and the Celtics.